1086 River Bay Road is a custom 5-bedroom waterfront home with incredible attention to detail and stunning Magothy River views. The unique architectural design is the perfect combination of modern appeal, with an open floor plan and ideal flow, with traditionally elegant detailing. The driving force in the design was to bring in the natural light and views, and the architect clearly succeeded. And, the waterside yard is truly a spa-like oasis with a heated in-ground pool and private pier. Built in the Maine waterfront Dutch colonial style, this waterfront masterpiece offers the perfect setting for entertaining family and friends, or relaxing and enjoying the views of the picturesque waterside yard and Magothy River. 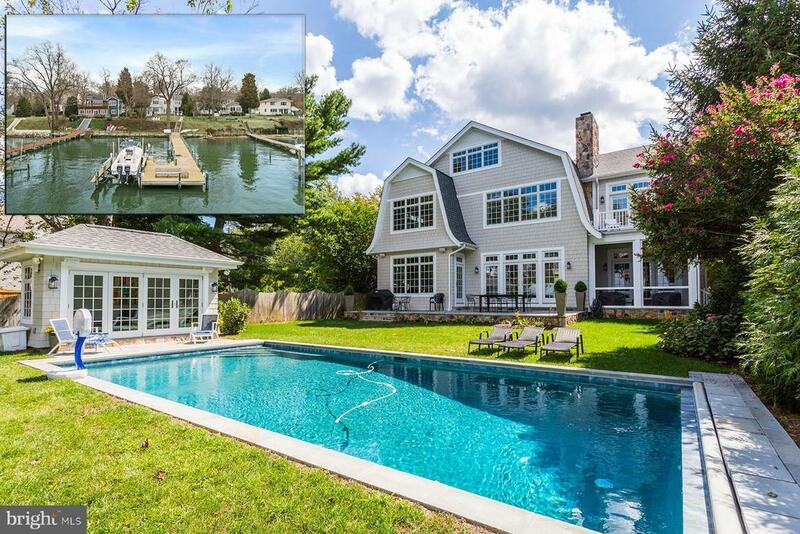 The outside amenities include a pool house with bi-fold French doors to fully enjoy the pool scene and water views, a New England fieldstone terrace, a screened porch, and outdoor sound system. The private pier, with 4 ft water depth, has a boat lift and two jet-ski lifts. The interior was modeled after homes in the Hamptons and includes antique authentic mid-century modern light fixtures. There are wide oak plank floors, a striking chandelier, and amazing trim detail ~ including wainscoting and an elegant staircase with matching oak railing. Through the foyer is the living room with a fabulous coffered ceiling and a one-of-a-kind Italian antique stone hearth and mantel around the wood-burning fireplace. The living room has French doors that open to the waterside fieldstone patio, and separate door that leads to the screened porch. Everything is perfect, with granite countertops, an oversized marble-top kitchen island with breakfast bar, inlaid custom cabinetry, a gas six-burner Wolf stove with a custom-built stainless steel hood, two Wolf ovens, and Sub-Zero side by side refrigerator and freezer. The formal dining space has custom lighting and a built-in side board with granite top. There is a butler~s pantry with ample wine storage and a beverage cooler, prep sink and counter space, and built-in display china cabinets. Also located on this hallway is a powder room and a mudroom, with laundry, that connects to the oversized two car garage. To the left of the foyer is a spectacular custom home office with raw mahogany paneled walls, coffered ceiling, custom bookcase and cabinetry, and a built-in double-sided desk. There is an attached bathroom so it could be a first floor guest suite. Upstairs there is a luxurious master suite. As you step inside your eyes are immediately drawn to the massive waterside windows and the views that they provide. Wake up every morning with the Magothy River sunrise views and, in the evening, enjoy sunset water views and a crackling fire in the stone-surround fireplace. The suite includes a private sitting room with access to a private waterside deck. There is also a luxe master bathroom with two vanities. This level features two additional bedrooms, one with river views, and each with private bathroom. There is a second laundry on this level. The gorgeous spiral staircase takes you to the third level crows nest. The second level includes a spacious family room, in the space above the garage. The huge family room has room for comfortable seating as well as a pool table; there is also a kitchenette so your friends won~t want to leave on game day! There is even a third washer & dryer in this area in case you have guests who stay for a while. Upstairs from the family room, there are two bedrooms that share a full bathroom. The lower level is currently unfinished; with extra height ceilings, though, it offers additional options for those who want a home theater or dedicated gym space. There are truly too many details to mention; but, for the tech lover, there is a professional security system including interior & exterior cameras, 4 HVAC zones, and 11 flat panel TV~s. Schools include Cape St. Claire Elementary, Magothy River Middle, and Broadneck High School. VIDEO TOUR! Directions: Rte 50 to Cape St. Claire exit. Straight through light across College Pkwy. Continue to dead-end at River Bay Road. Turn left, follow to #1086 on right.